By now you may have heard the world as we know it is over. Well, the Facebook world anyhow. Last Thursday, Mark Zuckerberg published a post about Facebook’s focus for 2018. The marketing world went crazy and started referring to this new change as “Facebook Zero” and the “Facebook Apocalypse” and…well, you get the idea. The Facebook marketing strategies that worked once upon a time, even as recently as yesterday, won’t work now. This isn’t just another annoying Facebook change to keep up on. This is the mothership of change. As I watched my marketing colleagues reel over this news, I couldn’t help but wonder why so many of them were freaking out. It just didn’t seem that riveting to me. I mean, most pages are only getting about 2% of their followers to see their posts anyway. We’ve moved the needle from 2% to almost 0%. Is all the hysteria really legit? Is the mass freak out really necessary? Are small business owners really doomed to die a slow and painful death? It’s not brain surgery. Do as Zuck says, and you’ll be happy. In short, post with a purpose. It’s no longer enough to just show people that the lights are on by sharing ho-hum, snooze-worthy content. You have to give people a reason to want to stay connected with you. My friend Rebecca does it right. And here’s the funny thing: she’s not even a marketer. She’s simply a small business owner that has always been about creating authentic community, one day at a time. Ten months ago she decided to go live on Facebook once a week. Less than 2 months later, she upped her game and started going live every single weekday. Even when she was hanging out at the spa with me. Fast forward to today and you’ll see she gets TONS of engagement on her videos. Every single one of them. It’s not unusual to see 40+ comments and 5-10 shares every single time she goes live. Not bad for a solopreneur that serves a very niche market, started just a few short years ago and operates on a very lean budget. In fact, I’d venture to say most small business owners would be positively tickled pink if they could get that kind of engagement on their page. And then there’s her Facebook group with more than 2,600 very active members. Take a look at how she writes her posts. Doesn’t this seem so different from most of what you see on Facebook? Like I said, Rebecca is all about creating authentic community. Here’s what we know: Nobody joins Facebook to see all of the skeletons in your closet. Nobody joins Facebook so you can convert them from one political ideology to another. Nobody joins Facebook to see endless pitches for weight loss supplements or skincare products. So why did they join Facebook? To connect! To, dare I say it, share life with you! 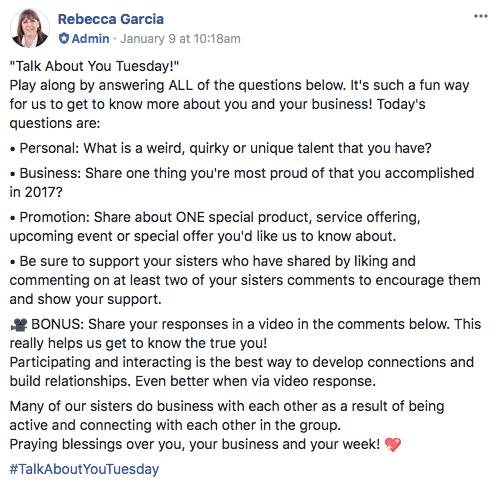 And in today’s marketing world, the most successful brands are those that, like Rebecca, create authentic relationships with their tribe. The ones that connect with their people consistently. The ones that share life with their community through story. If you want people to connect with your brand, you have to purpose to do so. Post weekly. Rumor has it episodic content will win. That means you need to post consistently. Weekly works. Daily is even better. Buy two simple (and inexpensive) pieces of equipment. You don’t need to spend a ton of money on fancy cameras, microphones and lights. We record all of our videos on our iPhone, using this simple microphone and this $15.99 selfie stick tripod. Our lighting comes from, you guessed it, the window. Why fix what ain’t broke? When God said “Let there be light,” there was light and lucky for us, it’s still free. Prepare, but don’t over prepare. It’s much more effective to humanize your videos with a little raw and unscripted action than to share perfectly produced videos that no one can relate to. Cat got your tongue? It happens to the best of us. If you’re smart, you’ll post the video anyhow. Be real. Be imperfect. It will make people trust you. And as we all know, people do business with people they like, know and trust. Engage like crazy. Keep an eye on the comments as you go live and be sure to encourage people to interact with you. Facebook lives should be a conversation, not a lecture. Call people out by name. Even a simple “Hi so-and-so! So glad you’re here!” will go a long way. People want to feel personally connected to you. When someone posts a comment, address them by name. It will catch their attention and make them feel valued. Ask them to vote on something. Opinions are like noses. Everyone’s got one. Give them a chance to share it! Preparing to launch a new product? Invite your community to vote on your top 5 name choices. Trying to decide when your next event will be? Invite them to weigh in. Debating between two topics for your next webinar? Ask your people what they want more. When you ask people to vote, you remind them their voice counts. And everyone wants their voice to count, right? Ask for recommendations. Traveling to a new city for business? Ask them for suggestions on where to stay and what to do. Need a new piece of equipment? Ask what they use and why they like it. Respond to their comments. While you’re sharing some people will likely pop comments in sharing their own perspectives and experiences. Encourage it! Acknowledge it! Intertwine it into what you’re already sharing. Re-read what Zuck said in his post: “You can expect to see more from your friends, family and groups.” That said, instead of banking on your page to make your connections, create a group! If you’re a personal trainer or coach create a group where people can share work out tips, healthy recipes, links to purchase great workout gear, etc. If you’re an accountant, create a group where you share tax tips, useful apps, and give your members the chance to get their quick accounting questions answered at no charge, etc. If you’re an interior decorator, share color trends, furniture reviews, tips on how to live abundantly within small spaces, etc. Invite your members to post pictures of their spaces that need some fresh ideas and let the other members weigh in with their ideas. Invite your email list to join. Link to your group from your business page, your email signature, your website, throughout your blogs, on your business card, etc. Tell people about your group when you’re at networking events, conferences, board meetings and when you’re speaking or sharing your expertise via a podcast and things of that sort. And when it comes to content, post stuff people love. Post tips and tricks related to your industry, ask for feedback, share sneak peeks, give members first dibs on your new offers, encourage members to post questions or their own tips and so on and so forth. Take the time to nurture your relationship with your members and figure out what they really want to see. Don’t worry, you don’t have to guess. Your group insights will tell you what your tribe likes the most. Give it a look and see for yourself. Once you find out what they love, post more of it. Remember, at any moment, Facebook could decide that groups are going bye-bye. Or that they’re only available if people are willing to pay for them. When you doing anything on Facebook, you’re do it on rented real estate. And you could get evicted at any time. That’s why it’s critical to grow your group on Facebook but to get your members on your email list as quickly as possible. To get more group members to sign up for your list, consider creating a lead magnet (a.k.a. “opt-in” or “bribe”) they can’t refuse. This can be a PDF, a video, access to a free tool you’ve created, or any number of things. Figure out what your audience really wants, and then give it to them at no cost in exchange for their email address. We do this often. In fact, we’ve got four opt-ins we’re promoting right now. Go ahead and grab one or all of them—we created them to help you! Get 75 proven and powerful email subject lines that you can customize in seconds! These formulas have generated millions of dollars in revenue! It’s your turn to use ’em! Get them FREE! Gain clarity, ooze confidence and create a bridge between your ideal clients and your company with this FREE, fill-in-the-blank brand blueprint. Ready to discover the niche you were born to serve? Look no further than this free Niche Finder that will position you to profit more and spend less. Whether you’re brand new to the speaking circuit or you’re simply ready to up your game, the Ultimate Speaker Cheat Sheet will guide you through the process of becoming a sensational speaker, so you can rock the stage in 2018! Get it for free, too! Facebook has given brands the option to invite their followers to actively select to see their posts first. Will everyone do it? Unlikely. Will most people do it? Probably not. Will some people do it? If you invite them, I’d venture to say yes. And here’s the best part. The people that do it are most likely your unpaid brand evangelists and/or the people most likely to start doing business with you. Those are the most important people for you to stay in front of anyhow, so you’re in good shape! Hover their mouse over the “following” button. Click “see first” in the news feed. Psssst…do us favor and opt to see SizzleForce first on Facebook now, won’t ya? Click here to go to our page. 4. Pay for ads. There. I said it. You’re welcome, Zuck. How will all of this shake out in the long run? Well, none of us know the answer to that yet but I can assure you of one thing: if you focus on building community with your tribe, you can’t go wrong. This is not the end of the world. This is an opportunity to post purposefully and to find out why authentic marketing works. Social media is constantly evolving, and marketing has to evolve with it. As long as you stay ahead of the curve and make the adjustments you need to make, there’s no reason your business can’t continue to get noticed on Facebook. And while your page is not a place to score a lot of free visibility anymore, it’s definitely something you need to keep. After all, your page is your link to Facebook advertising. Which, like it or lump it, will also have to be part of your strategy if you want to remain competitive. For more Facebook marketing tips and tricks, check out this post and to stay in the know for all things Facebook, join our Facebook Community now! This is very helpful content, Steph. Thanks! I’m on it! Thanks for reading, Paula! 🙂 You’re such a natural connector this should be easy peazy lemon squeezy for you. Great post! Thanks for reassuring us that the world is not over! You nailed it- we need to connect better via our Facebook posts. That was the purpose that Facebook was created for, so that’s the only true way to win at the game of Facebook in the long term! I think we biz owners are so good at systematizing things, sometimes we forget to humanize them. Gotta get back to basics! Thanks for the shoutout, Stephanie! It’s so exciting to know that I am ahead of the game! And you’re right, I’m not a marketer, but the marketing I love to do and do best is “relationship marketing.” It’s easier to love on people and have fun getting to know them than it is to “sell” to them. And, in my opinion, the results are much, much better. You are a force to be reckoned with, sister! Thanks for being a great example to the rest of us! Thanks so much, Stephanie! Really helpful, actionable, and encouraging!! So glad it helped you, Amy! Now, go kill it with your awesomeness! What an awesome blog post, Stephanie. You’re right we just all need to connect, connection and collaboration is where it is going to be. Thank you so for sharing all this great information. My pleasure, Becky! Can’t wait to see where OUR collaboration takes us!